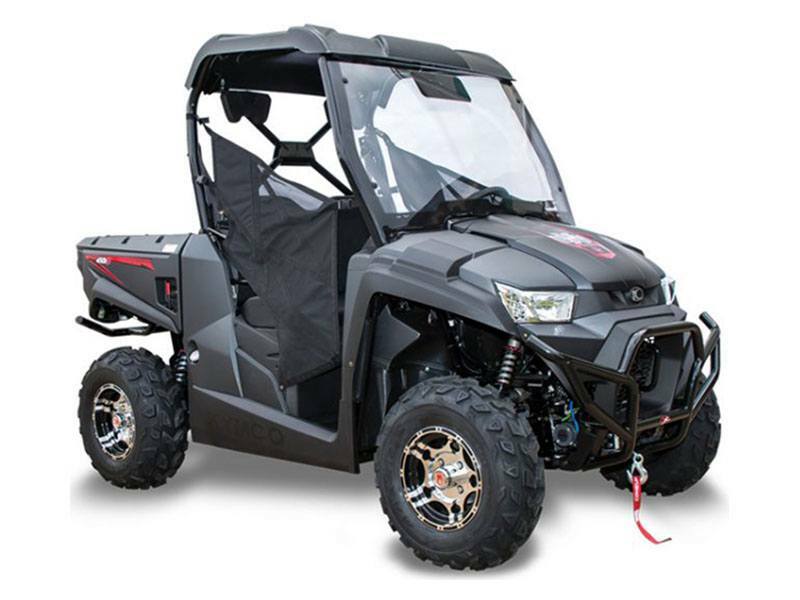 The KYMCO UXV 450i LE Prime is a prime example of the best-optioned load-it-and-go and go-and-load-it UTV, that fits in most every full-sized pickup. Built for hard play and serious work, the overachieving and optioned-up midsized UXV 450i Prime’s premium standard equipment includes: black and silver aluminum 12 in. alloy wheels; 3,000 lb. NuJet winch; hard top; windshield; Elka Shocks Stage 1; front and rear bumpers. The KYMCO UXV 450i Prime leads with its 443cc compact engine with EFI, and it all fits inside the bed of most full-sized pickup trucks. Additional standard features are: bench seat; tilt steering wheel; 440 lb. bed capacity; gas-assist rear dump bed; built-in tailgate storage box for gloves and tools; dual beverage holder; standard 2 in. receiver; shifter gate to ensure proper gear selection. The outstanding ground clearance and class-leading front and rear independent suspension provide this Prime big-boy sure-footed handling. For rough and rugged terrain, shift from 2WD to 4WD—with differential lock—for a maximum drive.